The opening of new Siemens’ offshore wind plant in Hull has been hailed as a major step forward for the UK’s offshore wind sector. The £310m redevelopment of Alexandra Dock by Siemens and Associated British Ports will create 1,000 jobs, 700 of which have already been filled by local people. The site – which represents Hull’s largest-ever inward investment and is one of Siemens’ largest-ever investments worldwide in manufacturing facilities – includes a factory which will manufacture blades 75m long, and a dockside plant assembling turbine towers 82m tall. 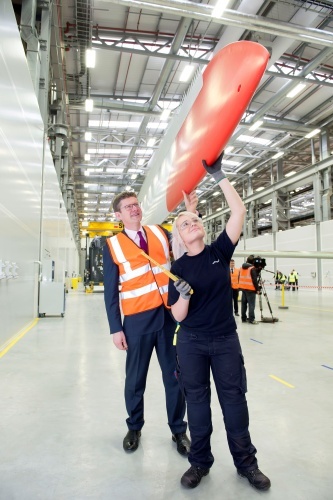 Visiting the new facility as the first 75m blade rolled off the production line business secretary Greg Clark MP said: “Hull has established itself as an important manufacturing and engineering centre for this innovative and exciting new industry. In the coming years the new offshore wind projects that this factory will supply could generate enough clean electricity to power over three million homes and businesses – all with wind turbine blades produced by the dedicated and highly skilled Siemens workforce right here in Hull. The first wind farm that will benefit from Hull is Dudgeon, off the Norfolk coast, which will be able to use the facility and quayside for part of its installation of Siemens offshore wind turbines. The Dudgeon wind farm will comprise 67 of Siemens’ 6 MW offshore wind turbines, which have the world’s longest blade in commercial operation at 75m in length. With an overall capacity of 402MW Dudgeon will provide clean power to over 410,000 UK households. Good news for Hull that Siemens have a t long-last put some of their profits from wind blown white elephants back into the UK. The bad news is that if the UK continues to invest all its electricity budget in wind there won’t be any industry to use the unreliable power provided. Also, as usual in these advertising and fund-raising publicity shots, the figures are dishonest: 402 MW of intermittent wind will provide poser for about 100,000 UK households intermittently: the rest of the time they will have to hope that someone invest in alternative power generation for those cold winter days when the wind does not blow much. The desperately needed investment in stand by power is looking less likely daily because of the massive subsidy paid to wind generators. Interesting post, however, without any factual foundations whatsoever. I presume Jack would rather support building nuclear power using an unproven design and having the taxpayer foot the bill for a hugely exaggerated strike price. With a parallel investment in increased Hydro storage (increased capacity at Cruachan, Tidal lagoons in the Bristol Channel, battery storage, compressed air storage, etc) the intermittent nature of wind power will be of no consequence. We just have to get there. Jack, just be pleased that they will no longer be imported components for the new wind power industry. We have to move on from living in the past. The story’s about the Hull factory, which was officially opened last week (Nov 2017). Unless i am mistaken, I am looking at a structure which has an uncanny resemblence to an aircraft ‘wing’. Have these two technologies been combined? Are their lessons to be learned by both from the other? I don’t like to say it but the only way forward for electrcal power is to have more smaller nuke power stations dotted around the country connected to the grid. AP Jones: VMT for your correction: Your first of your other two comments I applaud. The second of which (to misquote Manuel) I know very little! Everything’s expensive until you start producing a lot of it – especially those batteries in the phones that you maybe using to view this website. The great thing about wind as far as I can see is that you can add to it incrementally, maintain and upgrade it incrementally too like those small modular nuclear reactors that are being talked up – except that we can do it now. If it creates a market for energy storage system to even out the variability then so much the better.